Our plantation shutters offer traditional elegance along with custom features and construction that are built to last a lifetime. With our shutters, you can transform ordinary windows into an ever-changing source of light and shadow. We offer the finest in hardwood and composite shutters from top manufactures. Our expert design and installation ensures your satisfaction. Click on any of the styles of blinds below for more details about each type of shutter. Beautiful gained, quarter sawn hardwood. Hidden or invisible tilt available. Multiple frame options from simple to elaborate. Choose from a variety of paints and stains, or we can color match to your specifications. Louver sizes from 1” to 4 1/2”. Specialty shapes and arches available. Track system – for sliding panel applications. French door cutouts – for handle and doorknob access. Excellent insulating benefits, keeping rooms cool in summer, and warm in winter, while keeping energy bills down. All shutters custom made and professionally installed. All Shutters carry a Limited Lifetime Warranty. Do you love the traditional elegance of wood shutters but not the price tag? Our composite shutters provide the highest performance at a value price and add an enduring, distinctive accent to any home. Appeal of wood without the expense. Louver sizes from 1 7/8” to 4 ½”. UV – inhibiting finishes resists staining, fading, and yellowing. Composite material resists warping or cracking. Still Considering Shutters? Read This! Shutters, with their fine furniture qualities, can be a beautiful addition to any home or office. Shutters are a low maintenance, durable product with a classic look that never seems to be out of style. 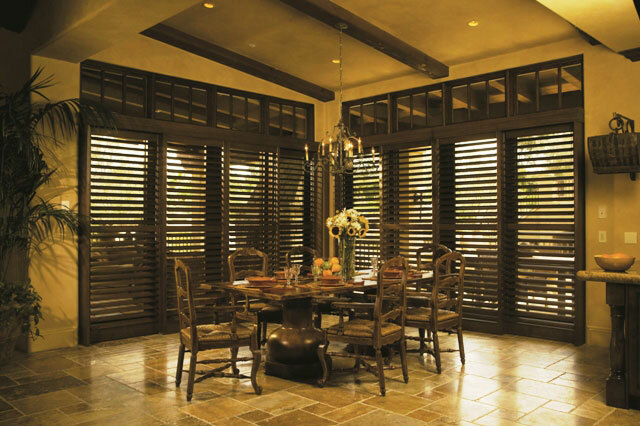 Because shutters are a product designed to be in place longer than the average window covering (i.e. shades, blinds etc.) carefully consider your current décor AND your future décor. If you are planning a remodel in a year or two consider this when planning any window covering purchase, especially shutters. While shutters are very durable and long lasting, we all know things go wrong. We’ve seen all kinds of shutter “accidents” ranging from puppies using the slats as a chew toy, cats testing their climbing skills, indoor basketball gone wrong… you name it. Luckily, shutters are not a throw away product, and they can be repaired and often rebuilt using original equipment parts. 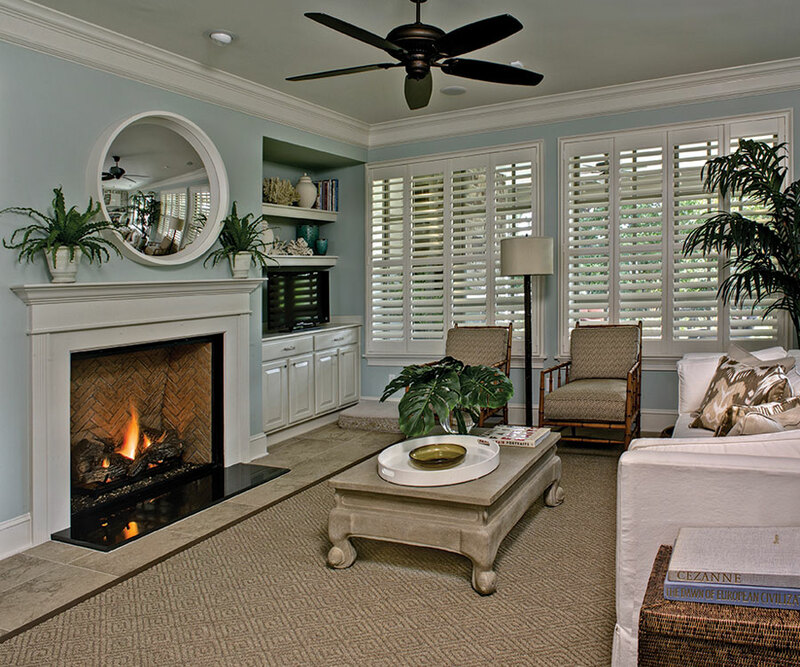 Shutters have a misconception of being overly expensive, and often out of reach for many folks. While shutters are not exactly inexpensive, there are a lot of brand name products on the market that are more expensive than a quality shutter. For budget purposes plan to pay in the low $20’s/ square foot, for a good quality shutter and professional installation. Shutters are completely free from cords, making them an ideal choice for families with small children or pets. While shutters are beautiful and look seamless once installed, getting them to the point of perfection isn’t exactly easy. At Peak Window Coverings, we are all for DIY’ers doing their thing but, we do not consider shutter measuring, ordering or installing, a project well suited to the average homeowner. This is a good project to leave to the PRO’s! Peak Window Coverings has a team of shutter experts to assist with your project, from start to finish. We offer very competitive pricing (better than the box stores) and products that are second to none! If you want an estimate for new Blinds, Shades or Shutters. Please call to schedule an in home/office appointment. If you’d like to visit our shop/showroom, please call ahead to make sure a salesman is available. For ultrasonic blind cleaning or repair, you can drop off your blinds or shades anytime during our office hours. If you need an in-home appointment, please call to schedule.